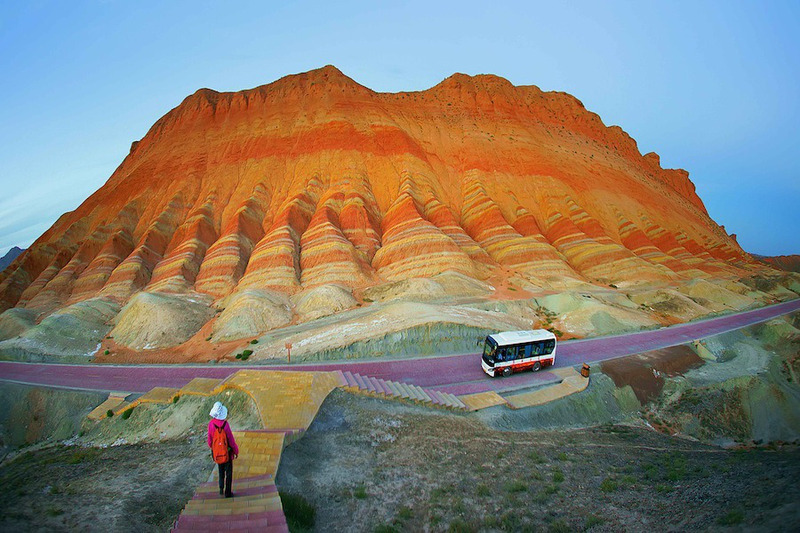 A visitor standing on steps watches a bus passing in the Zhangye Danxia Landform Geological Park in Zhangye, northwest Chinas Gansu. The Danxia (red rays of the sun) landform is a unique type of petrographic geomorphology which is found only in China, consists of red-colored sandstones and conglomerates of largely Cretaceous age. The unusual colours of the rocks are the result of red sandstone and mineral deposits being laid down over 24 million years. The resulting layer cake was then buckled by the same tectonic plates responsible for parts of the Himalayan mountains. Wind and rain finished the job by carving weird and wonderful shapes including natural pillars, towers, ravines, valleys and waterfalls – that differ in colour, texture, shape, size and pattern. The area is fast becoming a popular tourist attraction for the sleepy town of Zhangye. A number of boardwalks and roads have been built to encourage visitors to explore the amazing rock formations.